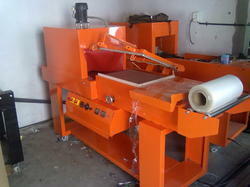 Keeping track of the latest market developments, we are introducing a well-engineered range of Shrink Packing Machine. The machine uses electronic speed control motor, a large range of speed regulation, weight bearing up to 40kg. Heat shrinkage furnace adopts fully enclosed endogenous wind circulation device. Highly convenient in operation and low in maintenance, these can be applied to any heat shrinkable packaging shrink film. Also, our machine undergoes stringent quality checking procedures in order to supply flawless range to customers.